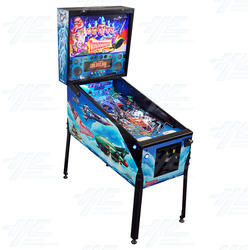 Thunderbirds Pinball machine is distributed in Australia by Highway Entertainment and is based on the hugely popular UK science-fiction television series, lovingly recreated by Homepin as a modern pinball machine. Unlike other pinball factories, Homepin machines come plug and play with components such as shaker motors as standard. Thunderbirds Pinball immerses players in all the action of the International Rescue Team, featuring authentic character voices and original music. The Playfield includes Tracy Island with its retracting swimming pool and palm trees; just like in the classic 1960s thunderbirds tv series. Creating a retro look and feel combined with some modern twists. With the ultimate aim of defeating International Rescues nemisis The Hood, the multi-game play of this machine makes it suitable for both novice and experienced players alike. <iframe width="640" height="360" src="https://www.youtube.com/embed/FJrzpo13eAU" frameborder="0" allow="autoplay; encrypted-media" allowfullscreen></iframe> <font color="red"> <b>SPECIAL OFFER - AUSTRALIAN BEST PINBALL WARRANTY</b></font color> Australia's best pinball warranty is available on Thunderbirds Pinball. We offer 12 months warranty on everything (yes, everything - including DMD, PCBs, coils, switches). For major components we will ask you to return these parts to us on exchange for new - please note, labour costs are not included. Operate in a store/shop, take it home, share it, sell it (yes, the warranty is TRANSFERABLE)….we will honour the 12 months warranty – Australia’s best warranty. IN STOCK RIGHT NOW IN SYDNEY. Thunderbirds Pinball machine is distributed in Australia by Highway Entertainment and is based on the hugely popular UK science-fiction television series, lovingly recreated by Homepin as a modern pinball machine. Unlike other pinball factories, Homepin machines come plug and play with components such as shaker motors as standard. Thunderbirds Pinball immerses players in all the action of the International Rescue Team, featuring authentic character voices and original music. The Playfield includes Tracy Island with its retracting swimming pool and palm trees; just like in the classic 1960s thunderbirds tv series. Creating a retro look and feel combined with some modern twists. With the ultimate aim of defeating International Rescues nemisis The Hood, the multi-game play of this machine makes it suitable for both novice and experienced players alike. Australia's best pinball warranty is available on Thunderbirds Pinball. We offer 12 months warranty on everything (yes, everything - including DMD, PCBs, coils, switches). For major components we will ask you to return these parts to us on exchange for new - please note, labour costs are not included. Operate in a store/shop, take it home, share it, sell it (yes, the warranty is TRANSFERABLE)….we will honour the 12 months warranty – Australia’s best warranty. IN STOCK RIGHT NOW IN SYDNEY. Thunderbirds Pinball machine is based on the hugely popular UK science-fiction television series and lovingly recreated by Homepin as a modern pinball machine. Distribution by Highway Games.